Good News! As of May 1, 2018 Blue Cross Blue Shield of Massachusetts will reimburse for the Shingrix vaccine for adults age 50+. Harvard Pilgrim may be the next insurance to sign on. Other private insurers will allow payment beginning September 1, 2018. Unfortunately, Medicare will not pay for the Shingrix vaccine. A second injection is required 2-6 months after the first. Please call the office for more information (508) 833-8020 or to schedule an appointment. It’s time to start preparing for the Cape Cod tick season. Lyme disease, babesiosis, anaplasmosis, miyamotoi, and now Powassan are names you should be familiar with. Back in the day, we had ticks. Big, yucky American dog ticks. They usually crawled to the top of your head, you felt a lump, pulled the tick out, flushed them (or found some other form of revenge), and that was that. Usually no one got sick. Ticks were mostly just an annoyance, and that’s what people knew about ticks. 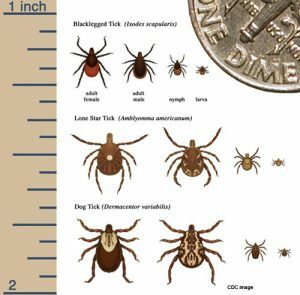 American dog ticks are still around but these days, there’s another tick, a tiny blacklegged tick, smaller than a freckle. It’s also known as the deer tick, and it crawls up under clothes, latches on without much fanfare, and these ticks are LOADED with disease-causing pathogens. Once attached to people or pets, deer ticks are just hard to find! Their numbers are on the rise and they occur in more & more places – even your backyard! Read our “Top 10 Things Everyone Should Know About Ticks These Days” and stay disease-free. Ticks don’t jump, fly, or drop from trees onto your head and back. If you find one attached there, it most likely latched onto your foot or leg and crawled up over your entire body. Ticks are “programmed” to try and attach around your head or ears. On their normal hosts, ticks also usually crawl up; they want to blood feed around the head, neck, and ears of their host, where the skin is thinner and hosts have more trouble grooming. Ticks hatch from eggs and develop through three active (and blood-feeding) stages: larvae (small-the size of sand grains); nymphs (medium-the size of poppy seeds); adults (large-the size of apple seeds). If you see them bigger, they’re probably partially-full or full of blood. That’s right! Adult stage deer ticks become active every year after the first frost. They’re not killed by freezing temperatures, and while other ticks enter a feeding diapause as day-lengths get shorter, deer ticks will be active any winter day that the ground is not snow-covered or frozen. This surprises people, especially during a January thaw or early spring day. Remember this fact and hopefully you’ll never be caught off-guard. The only way to get Lyme disease is by being bitten by a deer tick or one of its “cousins” found around the world. 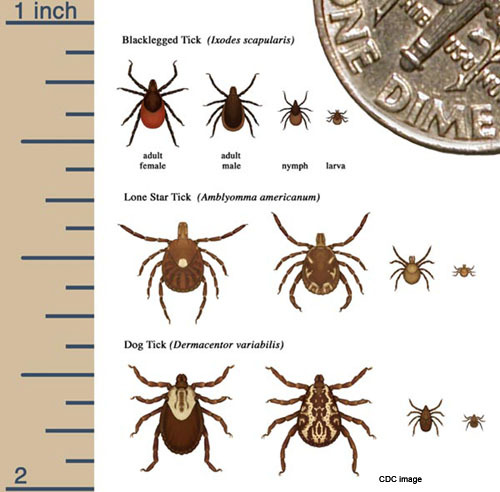 Deer ticks also are known as blacklegged ticks in the U.S., sheep ticks in Europe, or Taiga ticks in Asia. Dog ticks, Lone star ticks and other types of ticks just don’t seem to be able to transmit Lyme disease. While that’s good news, it makes saving any tick that you find biting more important so you can identify it. Doing so may save a lot of unnecessary doctor visits and treatments. 5. For most tick-borne diseases, you have at least 24 hours to find and remove a feeding tick before it transmits an infection. Powassan virus is an exception. Even a quick daily tick check at bath or shower time can be helpful in finding and removing attached ticks before they can transmit an infection. You’ll probably want to check even more carefully if you know you’ve likely been exposed. Many of the disease-causing microbes transmitted by ticks need a “re-activation” period in the tick once it begins to feed. The germs eventually make their way into the tick’s salivary glands and the tick spits them into you while feeding. Some infections, especially viruses, move into the tick salivary glands faster than others. Lyme disease bacteria take at least 24 hours to invade the tick’s saliva. And with about 1 out of 4 nymphal deer ticks carrying the Lyme disease spirochete and other nasty germs in the northeastern, mid-Atlantic, and upper mid-western U.S., it’s important to know what you’re really looking for. They’re easy to miss, their bites are generally painless, and they have a habit of climbing up (under clothing) and biting in hard-to-see places. Think of a tick as a little germ-filled balloon. Squeeze it too hard on its back end, and all the germs get pushed to the front end, which by the way, is attached to you by the tick’s straw-like mouthpart. Using really pointy tweezers, it’s possible to grab even the poppy-seed sized nymphs right down next to the skin. The next step is to simply pull the tick out like a splinter. Don’t worry if the mouthpart stays in your skin as long as you’ve got the rest of the tick by its head. Other tick removal methods, like a hot match, Vaseline, dish soap and cotton, or various little key-like devices don’t work as consistently as pointy tweezers on all types of ticks. Remember to save the tick and try to identify it (see # 6). An easy way to avoid tick bites and disease is to wear clothing (shoes, socks, shorts or pants, and shirt) with permethrin tick repellent built-in. This strategy can be especially effective for protecting children. Dressing kids in tick repellent clothes everyday is a safe and easy way to keep ticks from biting and transmitting disease. Commercially-treated tick repellent clothes last through at least 70 washes, while using kits or sprays to treat your current outdoor wardrobe can last through 6 washes. Tick repellent on clothing, not skin is something everyone needs to know about to stay safe outdoors. There’s really only one way you get a tick-transmitted disease and that’s from a tick bite. Reducing tick abundance in your yard where you spend a lot of time, wearing tick repellent clothing everyday, treating pets every month with tick repellent spot-on products, getting into a habit of doing a quick body scan for attached poppy-seed sized or larger ticks, and pulling ticks off quickly and safely are all great actions for preventing tick bites. These days, ticks are more than just an annoyance. 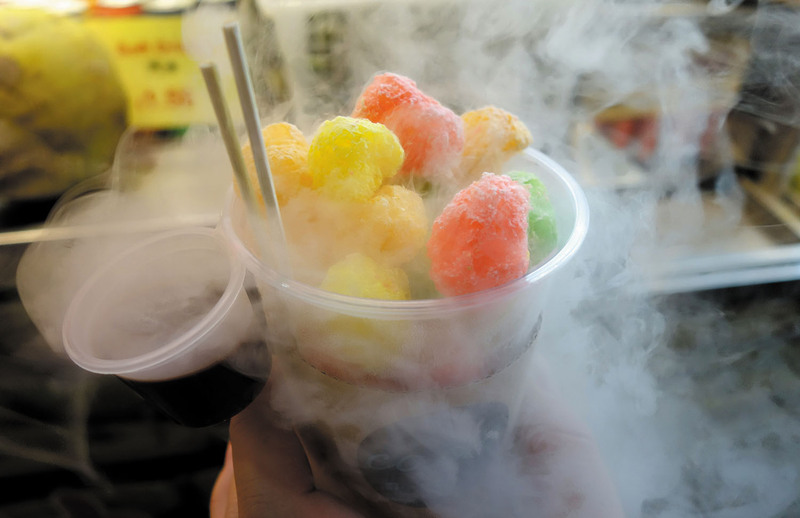 One bite can make you sick, even change your life! Remember these 10 things and you’ll stay safer. The author is professor of public health entomology at the University of Rhode Island, and is director of the non-profit TickEncounter© Resource Center. His Think T.I.C.K Take ACTION! strategy and toolbox for tick-safe living is available on www.tickencounter.org. This microsite offers important flu information for consumers on the flu basics, prevention, and treatment.